Elegance and quality abound in this custom estate home on 2.25 private acres backing to Westfields Golf course in the sought after community of Balmoral Greens. 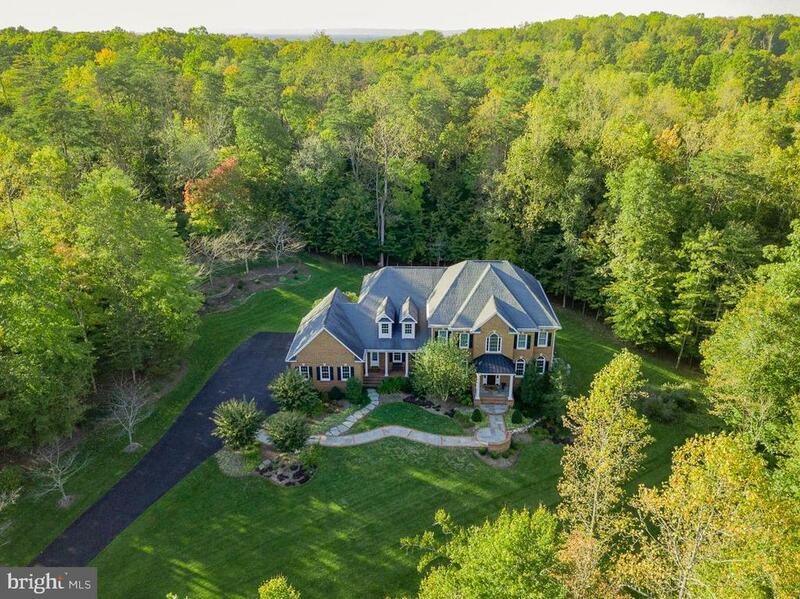 Spanning over 7700 sq ft, the residence is expansive yet has a warm and inviting feel with 5 bedrooms, 5 full baths, 2 powder rooms, and a fully finished walk out basement. Truly an entertainers dream home ~ from the open concept kitchen, to the basement bar and wine room, to the outside patio area. The recently remodeled chefs kitchen features professional appliances ~ Wolf 48 inch range with one and half ovens and an additional wall oven/microwave, Miele dishwasher, Miele built in coffee/espresso station along with wood paneled refrigerator, a wine fridge, veggie sink, granite, huge island and quality cabinetry. The family room features a coffered ceiling and gas fireplace with custom wood mantel. The owners retreat with sitting room, built in bookcases, gas fireplace, and custom closet is the perfect place to relax along with the spa bath featuring Jacuzzi jetted bath tub, triple shower heads, and his and her custom vanities with granite. Three more spacious bedroom upstairs all have en suite remodeled baths with new lighting, mirrors, and granite vanities. The fine attention to detail in this home and abundant entertaining space continues in the basement with the fifth bedroom, additional full bath, billiard space with custom wet bar, rec room with the 3rd fireplace, and a spectacular 800+ bottle temperature-controlled wine tasting room/cellar. The private backyard features extensive hardscape with blue stone slate patio, firepit, hot tub, sprinkler system. Meticulously maintained by the owners with many major systems replaced including hot water heaters, AC compressor, upstairs HVAC, driveway and more. Too many upgrades throughout to mention, this home is a must see in person to appreciate the quality craftsmanship and amazing attention to detail. The community is home to the Westfields Golf Club and has direct access to the Bull Run Regional Park system with over 17 miles of trails for hiking, nature walks and horseback trail riding. Located within minutes from Rt 28/29, Rt 66, Braddock Rd and the Fairfax County Parkway.